Big bus companies better watch out, because the tech industry now seems to have them squarely in their sights. It was only a matter of time before the same forces that brought competition to the taxi industry turned their attention to the bus business. And now, what Uber and Lyft have done for ride-sharing inside cities and towns across America, startups like Skedaddle want to do for ride-sharing across America. Launched by a clutch of east coast entrepreneurs led by Adam Nestler, his brother Craig, Brad Werntz and Lou Harwood, Skedaddle began two years ago as a way to bring millennials onto the festival express. The idea initially was to tap into the demand from folks looking for a way out of their blasted urban hellscapes and out into the world of the weekender. It’s a world filled with music festivals, art festivals, ski weekends, beach weekends and all the other thousand pleasures that kids packed five-a-person into one-bedroom lofts in posh (or not-so-posh) or hipster (and not-so-hipster) neighborhoods dotting the Eastern seaboard can never experience in their commuter train/bus/light-rail and Lyft-or-Uber bound existence. And so Skedaddle was born. Initially begun as a website, the company is transitioning to an app-only business (aided with a new $2.1 million round of funding from investors led by Arena Ventures). Users can think of Skedaddle as a Lyft line or Uber pool for either a public or private weekend getaway. Initially someone planning a public trip can post their route on the app (in a bid to encourage user adoption, the person who plans the trip rides for free), and then enlists at least 9 other people to come along (at a discounted rate). Once a group of 10 is booked, the ride will happen and anyone else can come along. The chartered rides max out at 54 seats per trip. Private trips can be scheduled for any number of people, and Nestler says the bulk of the company’s business is coming from public trips. “As we grow density and users in each city… this becomes as reliable as a schedule without a schedule,” Nestler said. According to Nestler, there are roughly 4,000 charter bus companies in the U.S. that own between two and ten buses each. These companies tend to book one-off engagements in an incredibly fragmented market, which means there’s a lot of downtime and stranded buses. “Each bus asset sits idle 75% of its life,” Nestler said. From its experience building out a database of all of these private charter companies, Skedaddle now has a nationwide network it can pull from. The company is also trying to find ways to upgrade these fleets and look at making these buses electrified and autonomous or semi-autonomous, Nestler said. “What’s interesting is that self-driving technology in cars is the most complicated because you’re dealing with the most variables,” according to Nestler. Meanwhile, his short-haul bus trips (or even longer haul bus trips) are akin to a truck route — primarily a single lane on a highway. That means fewer roadblocks to making semi-autonomous or autonomous bus fleets a potentiality. “We’re trying to lead that charge,” Nestler said. Car ownership is declining and with the advent of autonomous vehicles, Nestler and his team believe that there will be a generation that grows up not owning cars. That same generation will still be looking for a way to get out of the increasingly urban environments where they’re choosing to live (at least… that’s their theory too). Skedaddle began its business with the short-haul trips from cities to the far flung venues where summer concerts, festivals and sporting events tend to live. This is all part of a phenomenon first put forward by Harvard Professors in a book nearly as old as Nestler himself. It’s based on the idea of the “experience economy” that has superseded the service economy of late American capitalism. It even garnered the attention of the punditocracy in a spectacularly tone-deaf piece by David Brooks for The New York Times. The thesis of tapping into the experience economy, and giving folks an easier way to get there was what initially struck Paige Craig, an early investor in Lyft, about the company. “Consumers are going to get on bus rides,” said Craig. Venues, he added, are going to be happy to give over their lists for a company like Skedaddle, because it can be used as marketing to drive people to their event spaces. Finally, Craig said, the trend lines were there too. “I love all these market conditions where he’s going to make it easy for consumers to escape the city… bus companies are going to increase destinations… And you’re looking at a huge segment of the population that’s not going to own a car,” Craig said. Other startups have already come and gone with services that look similar to Skedaddle’s chartered offerings. 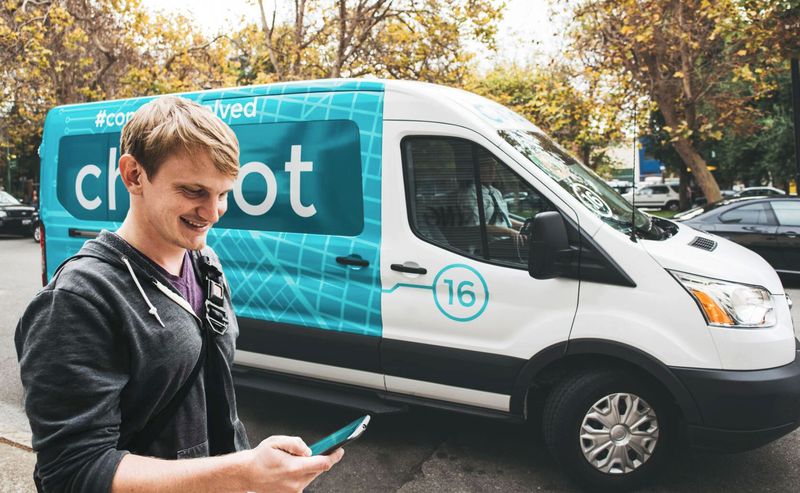 Chariot, which was acquired by Ford earlier this month, was offering its own version of shared transportation. Chariot’s goal was to provide a transit situation that sits near public transit in terms of cost, but that provides faster and more convenient routes. The platform crowdsources the creation of routes, aggregating desired pick-up and destination data from user interaction with its app and determining routes once interest in a particular one reaches a tipping point. It currently has 28 routes in the Bay area, with 100 vans in operation. Meanwhile, Skedaddle is looking at about 250,000 rides in 2016. The company has partnered with events and venues like Bonnaroo, SoGlobe, and Gillette Stadium. The company is currently arranging rides for 50,000 riders per month and the average ride for each passenger is around $40, according to Nestler. That revenue and demand creation means that the private bus operators are partners rather than competitors for Skedaddle. The company’s biggest competition, and why it marshaled investors like Arena, Corigin Ventures, Aspect Ventures, and Seamless founder Jason Finger; is to tackle bus companies like Greyhound, Megabus, and Peter Pan.